Ok, let’s start with the basics: Who are you and what exactly is the Stillness of the Wind? My name is Coyan Cardenas aka Memory of God and I’m a solo developer and director of Lambic Studios. The Stillness Of The Wind is a slow-paced, melancholy game about life and loss, where you play as Talma, an elderly goat farmer as she tends to her isolated homestead while nostalgic tidings from your family in the city turn ever darker. Stillness of the Wind is a follow up to your previous game Where the Goats Are. Why did you decide to expand on Goats rather than make a new series? Where the Goats Are was originally intended to be a month long project done for practice in my spare time. It ended up taking around 3 months but that is still a very short time for a game dev cycle, and it also meant that for 2/3rds of the development time I was “late” and rushing to release as soon as possible. The scope was minimised in order to fit the time frame, and although I think the limited scope is one of the game’s main strengths and was the #1 reason I finished the game at all, there was still a lot that I wished I could have explored but didn’t have the time. So although the game was finished I didn’t feel “finished” with the idea, hence The Stillness of the Wind. What have you added to the game that will surprise players of Where the Goats Are? Hopefully a lot! Without wanting to ruin anything, I think Goats players will be pleasantly surprised by the fact that the camera actually moves this time around which allows for a more intimate view into Talma’s home and work and allows for exploration of the area surrounding Talma’s homestead. There is a bunch of new mechanics like goat breeding (yes, baby goats), gardening, foraging, light customisation of the homestead, the story is all-new etc. And there is a good few easter eggs for players of Goats to pick up on if they’re paying attention. Goats was, and Stillness is shaping up to be, a really somber experience. What draws you to tell these kinds of stories? Honestly, I don’t know. I have just always been drawn to darker, more melancholy stories, so when it came to making my own I naturally gravitated towards that. A few of the main inspirations for the themes of nostalgia and loss were films from two of my favourite film makers, “Nostalghia” by Andrei Tarkovsky and “The Turin Horse” by Bela Tarr, and the book “100 years of solitude” by Gabriel García Márquez, which all have quite bitter ends. For me, there is nothing better than a good, tragic story :). 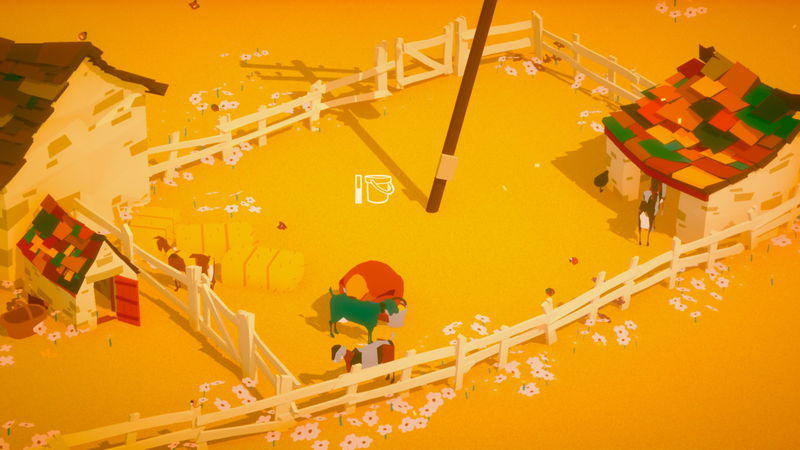 Stillness is a game that takes a really intimate look at rural life. Why did you go with this setting, and how does it tie in to the story you want to tell? The seed for the original game was inspired by the fact that my girlfriend and I were getting tired of life in the city (we were both living in London and working in Architecture practices at the time) and we’d fantasize about leaving London and our jobs to live out in the country somewhere on a little homestead and raise goats. So the original idea was to do just that, make a game where you just raise goats on a farmstead. It was only after I’d started working on that game that the story as it’s told emerged, and for me the most interesting part of it was not the story itself, but the fact that the events are happening elsewhere, and you are only learning about these events through the words of other people. So that feeling of isolation you get from being away from “civilization” is intricately tied to the structure of the narrative and the structure of the game itself. If the game took place in the city for example the game would be completely different, so the rural context is essential. In a way, it was a conscious effort to position the game as the antithesis to some of the mainstream trends I noticed in videogames: You do not travel the world on an epic adventure, you do not grow more powerful as you overcome tougher and tougher obstacles, you do not control a young, athletic protagonist, you do not kill anything, you do not save the world. Instead, you play as an elderly woman living out her quiet, final moments on an isolated homestead. The Stillness of the Wind is available now. The pole in the stock is a wire pole without cable? Some stories need to be told. This looks so beautiful! I was just wishing there were more games where you could play as an old woman! Bravo!